Qatar Airways has given me some of the best Business Class experiences I’ve had in all my years of flying but not all of its Business Class cabins are equal. If you want to be sure of a great Business Class seat you need to know which Qatar Airways aircraft to book and which to avoid as the difference between the airline’s worst seats (found on the A340s and some A330s) and the best seats (found in aircraft equipped with the airline’s Qsuites) is like night and day. On this trip I was flying between Stockholm and Doha on my way to catch a connecting flight to Singapore and Qatar Airways has laid on one of its Boeing 787 Dreamliners for the 6.5 hour flight. But how good or bad is the Qatar Airways Dreamliner? 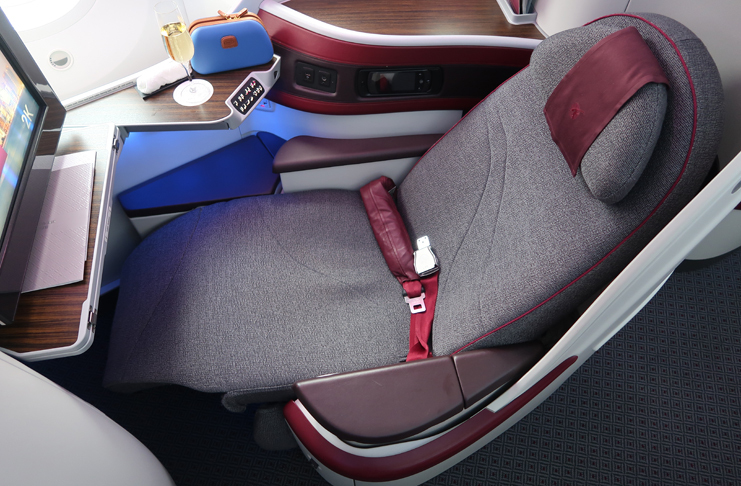 The Qatar Airways 787-8 Dreamliner offers a Business Class cabin with 22 seats set out in a 1-2-1 formation. All the seats in the cabin offer direct access to one of the aircraft’s aisles and the reverse herringbone layout they’re set out in is one of my favorite Business Class cabin layouts. There are no overhead bins above the center seats of the Business Class cabin…..
…and this helps to give the cabin a spacious feel. The best seats for solo travelers are undoubtedly the seats on either side of the aircraft…and this was where I was seated. The seat is angled towards the aircraft windows and, although it looks open to the aisle, it can feel quite private (the center seats are angled towards the middle of the aircraft so passengers in those seats are angled away from the window seats). The seat is well padded and can be a very comfortable place to relax during a flight…..
….and because there’s a lot of room around the head area when the seat is in lie-flat mode…. ….there’s enough space for travelers who like to sleep on their front (like me). The one aspect of this seat that I hear people complain about is the space that’s left for a passenger’s feet when the seat is in bed mode. The space around the seat narrows towards the area under the IFE screen when the seat is fully reclined…. I don’t have an issue here and I had a nice, short, restful sleep part way though this flight….but I know not everyone is a fan. When it comes to personal storage space this seat really shines. There’s a shelf at around shoulder height which is big enough to hold most items…. …there’s a smaller shelf under the window and, under this shelf is a cubicle which is deep enough to hold a 15” MacBook together with a good number of accessories. There’s a further cubicle under the armrest on the aisle…. …but you’ll first have to remove the airline’s headphones (and possibly the bottle of water provided by the airline) if you want to store anything here. Lastly, from a storage perspective, there’s a drawer which opens up at floor level from the seat back in the seat in front…. ….and this is just about big enough to fit a pair of size 10/11 shoes. Another nice aspect of the Dreamliner’s Business Class seat is the tray table. This is stored under the IFE screen…. When fully open this is one of the biggest Business Class tray tables I’ve seen. The seat controls are conveniently located to one side of seat and can put a passenger into just about any reclined position they wish…. What this means is that passengers aren’t entirely at the mercy of the crew when it comes to cabin temperature and, as a lot of Qatar Airways Business Class cabins tend to be on the warm side, it’s nice to have access to the vents to cool the seat area down. One possible annoyance comes from the IFE screen across the aisle but this will only affect passengers who choose not to wear their eye masks when going to sleep. The IFE screens are all angled back across the aisle which means that, if you’re trying to sleep without an eye mask, the cabin is in darkness and the passenger across the aisle from you is watching a movie or a TV show, the flickering from their screen can be disturbing. The content on offer from the Dreamliner’s IFE system is reasonably good (this link will lead you to a page showing what’s available on board right now) but I really don’t like the IFE controller. There doesn’t appear to be a way to select what you’d like to watch from the IFE screen so you have to make your selection from the controller…and it’s very hard going. The interface is clunky and the controller at my seat was not very responsive so it was just as well I had brought my own entertainment with me preloaded on my MacBook. Sadly the unresponsive controller wasn’t where my IFE issues ended – there was an issue with the volume control too. I’m not sure if the fault lay with the very ordinary headphones Qatar Airways provides…. …..or with the IFE itself but I couldn’t get the volume down to a reasonable level. At the lowest setting the IFE was muted and on the setting one up from mute the IFE tried to deafen me – it was unusable. Almost as soon as you board a Qatar Airways Business Class cabin you’ll be offered your choice of beverage and, if you’re going to choose champagne, I recommend avoiding the rosé and sticking with the brut. Drinks are always refilled up after take off (or you can choose an entirely different drink altogether) and warm nuts are offered too. On this flight the cabin crew handed out the menus after we levelled off and orders were taken a few minutes later. Qatar Airways offers a dine-on-demand service in its Business Class cabins so you can ask to have your meal at whatever time suits you best. On daytime flights I usually ask to have my meal half way into the flight (or possibly a little later) as I’ve usually had something to eat in an airport lounge before the flight. I’ve had this (or something similar) on Qatar Airways before and it was as good as I remembered it. The main part of dinner started with a roasted red pepper and tomato soup…..
…which tasted very nice but should have been served hotter. This tasted very fresh, it wasn’t overchilled (as some airline salads are) and there were plenty of pine nuts mixed in. The chicken was beautifully spiced, the rice was flavorful and, although the chicken would have been a bit dry on it’s own, it tasted delicious when accompanied by the raita. I declined the cheese plate and as tempting as the chocolate lava cake was I passed on that too – I decided to try out the “gourmet ice cream selection”. The ice cream flavors on offer were coffee and vanilla so I had a scoop of both…and they were rock hard. Still, after a few minutes the ice cream was no longer a potential lethal weapon and turned out to be a very nice end to a pretty good meal. After the remnants of dinner were collected there was a selection of teas and coffees on offer (I declined both) and the cabin crew brought around boxes of Godiva chocolates (2 chocolates in each box). Although I declined he teas and coffees I should point out that the selection on offer is very good….and there’s an espresso maker in one of the galleys so the crew can provide lattes and cappuccinos (as well as espressos). This was a daytime flight and Qatar Airways doesn’t provide pajamas on daytime flights (even if you’re traveling in First Class)…but there was a large pillow and a substantial blanket on every seat when boarding commenced. The pillow offered very good support and the blanket was one of the best I’ve had on an aircraft. It was large, weighty and on one side it was just like a regular airline blanket…. I wish they offered these on airlines that like to keep their cabins at temperatures best suited to penguins and polar bears as they’re incredibly warm and very comfortable. Qatar Airways offers Bric’s amenity kits in it Business Class cabins (at least that was the case at the time of this flight)…..
…but you won’t find any of the more regular amenity items (toothbrush, toothpaste, razor etc..) in these kits as all of those are on offer in the lavatories. The lavatories on the Dreamliner are a pretty good size (although nowhere near the size of the lavatories found on some A380s)…. The Qatar Airways 787 Dreamliner comes equipped with overwater wi-fi but I’ve never really tried it out. I must have flown with Qatar Airways at least twenty times but because I dislike the way the airline charges for wi-fi I generally avoid it. I once tried to use it when I flew in Qatar Airway First Class (and it was complimentary) but it refused to work and I’ve tried to use it a few times when Qatar Airways offers a courtesy free period…. …but I’ve never had much luck with the wi-fi then either. The main issue I have is that Qatar Airways charges for its wi-fi based on time and usage…. I really don’t like this way of charging for wi-fi because I have no idea how long 100MB/200MB will last me if I’m surfing the net or if I’m working on the blog….and I have little interest in potentially paying $20 for a couple of hours work when I know that other airlines charge less than that for unlimited access for an entire flight. If any readers have given the Qatar Airways wi-fi a proper test please let us know if the comments what you thought of it – thanks! I can only think of one Qatar Airways Business Class flight that I’ve taken where the cabin crew weren’t particularly great…and that was some years ago. Nowadays the crews are almost always very good and occasionally they’ll be excellent…and this crew fell somewhere in between very good and excellent. There were only 11 passengers in Business Class on this flight so that may have had a lot to do with how good the crew were but that shouldn’t detract from how pleasantly they interacted with passengers and how attentive they were (without being overbearing). Service was cheerful and efficient. All the flight attendants addressed passengers with a smile and none seemed to mind when some of the passengers used their call buttons to get their attention (try doing that on a US legacy carrier and see where it gets you!). As always seems to be the case with Qatar Airways cabin crews the remnants of meals and drinks were repeatedly quickly cleared away without there ever being a feeling that the crew were hovering….and this is an aspect of the service I really appreciate – it’s hard to get any work done or to relax/get some sleep if you have a tray table full of tableware in front of you. A cabin crew can go a long way to determining how good or bad a flight was and this crew couldn’t have done much more to make this a great flight. Overall this was a really good flight and it reinforced how much I like the Qatar Airways Dreamliner Business Class cabin. The cabin may not be up there with the Qsuites but then not many Business Class cabins can compete at that level – compared to all the other competition this is a very good cabin indeed. Good review … But … Can’t people 6ft and above review seats?